WinMount 64-bit can compress files, decompress/browse/convert compressed archieves, WinMount 64-bit can also mount MOU ZIP RAR and CD DVD HDD images to a virtual disk or virtual folder, which enabling you to use the files inside directly without extraction, saves your time and disk space dramatically. WinMount 64-bit supported formats: MOU ZIP RAR CAB ARJ ISO GZ BZ2 TAR WIM VHD VDI VMDK ISO ISZ BIN MDS/MDF NRG IMG CCD CUE APE FLAC WV. WinMount 64-bit Edition is utility which is dedicated to managing files & disks. WinMount 64-bit Edition can mount MOU RAR ZIP to a virtual disk or a virtual folder, which enabling you to use the files inside directly without extraction, saves your time and disk space dramatically. For instance: mount a ZIP file to a virtual drive. After mounting process, the newly created virtual disk will be opened immediately, all files inside ZIP will be listed in the new virtual disk. WinMount 64-bit Edition is also an image tool, supports mounting ISO ISZ BIN MDS/MDF NRG IMG CCD CUE to virtual DVD-ROM, supports mounting FLAC, APE, WV, WAVE to virtual CD-ROM, supports mounting VHD, VDI, VMDK, WMT, Microsoft WIM, and folder as a HDD virtual disk. In addition, WinMount 64-bit Edition can create a new blank RAM-disk, size from 64M to 4G, data will be lost when restart. 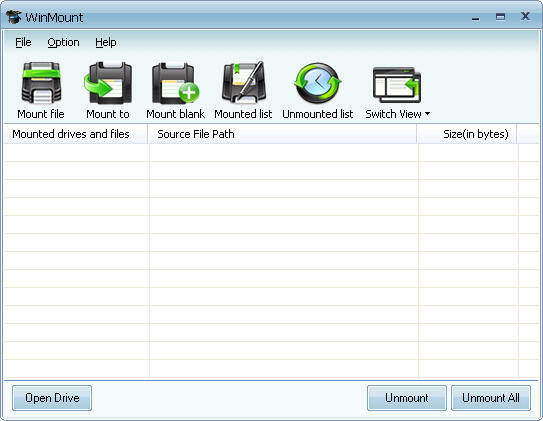 Mount ZIP, RAR, 7-zip, WIM or ISO file to a new virtual drive. A new type of game. Qweas is providing links to WinMount 64-bit Edition 3.5.1018 as a courtesy, and makes no representations regarding WinMount 64-bit Edition or any other applications or any information related thereto. Any questions, complaints or claims regarding this application WinMount 64-bit Edition 3.5.1018 must be directed to the appropriate software vendor. You may click the publisher link of WinMount 64-bit Edition on the top of this page to get more details about the vendor.